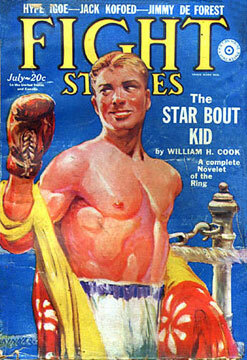 Fight Stories made its first appearance in June 1928, giving it the distinction of being the first all-fiction magazine dedicated entirely to a single sport. For years, boxing had been second only to baseball when it came to popular sports stories in The Argosy, Blue Book, and—of course—Sport Story Magazine, an all-sports magazine first published by Street & Smith in 1923. As popular as baseball stories were, an all-baseball pulp would not appear until the publication of Baseball Stories in 1938, ten years after the inaugural issue of Fight Stories, billed by the editors at Fiction House as a "CLEAN, PACKED-WITH-ACTION, ENTERTAINING magazine." "For stark drama [boxing] has never been equaled…. It has been the soul-food of a race of men who have carried civilization to the world's last outpost—the breed that has borne the white man's burden without whimper or retreat, who has built cities, spanned bridges and crimsoned a thousand battlefields with the last measure of courageous devotion…. FIGHT STORIES will be the story magazine of that sport and for those men. Its pages will be bright with the courage of he-men in a he-men's game." Boxing, then, was the perfect sport to have its own fiction magazine because no other mere "game" so effectively authenticated masculinity, and embraced excitement and adventure. One need only examine the advertisement for the American School of Aviation—inside the front cover of the first issue—to find what sort of men Fiction House had in mind when it came to potential readers: "You Daring Young Men / Seize Life's / Biggest Thrill!" Undoubtedly, Fight Stories benefited from the fact that boxing is a year-round sport with no official off-season. Fiction House may have reasoned that boxing fans were always in the mood for a good fight story, and the pure simplicity of a boxing match certainly made it a natural contender for good sports writing. Kofoed recruited many of the genre's best writers (including George Bruce, Theodore Roscoe, and Fiction House editor Jack Byrne) who, according to John Dinah, produced stories that were arguably "equaled by few writers of the day" (89). 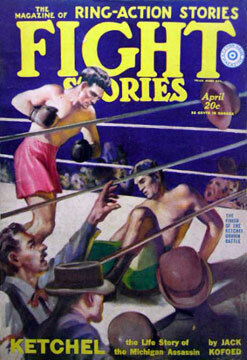 Consequently, Fight Stories proved to be one of Fiction House's most successful sport-related titles, and except for a four-year hiatus from 1932 to 1936, the magazine remained in semi-regular circulation until 1952 (106 total issues). Over its twenty-four year history, many authors contributed to the magazine, but few are as notable as Robert E. Howard. Although Howard is today best remembered as a writer for Weird Tales—in the pages of which he created Conan the Barbarian—he worked successfully in many other genres besides "sword and sorcery." One of his favorite genres, and the one most popular with readers during Howard's lifetime, was boxing stories. In a career spent largely writing stories about recurring characters, Howard wrote more stories about boxers than about any other kind of hero. In all, he is credited with writing twenty-eight of them for Fight Stories; although at least fifteen were published posthumously and sometimes attributed to the in-house pseudonym "Mark Adams." Howard's recurring character, Sailor Steve Costigan, is the self-proclaimed "heavyweight champion" of the Sea Girl, an Asiatic merchant ship and "The Fighten'est Ship Afloat." Although Fiction House's Action Stories and Jack Dempsey's Fight Magazine also published several of the Costigan tales, twelve of the thirty some-odd written by Howard were originally published in Fight Stories, including the first one, "The Pit of the Serpent," in 1929. Many of Costigan's fights stretch the limits of the term boxing (as opposed to outright fist-a-cuffs), but this was fairly common for many stories that appeared in Fight Stories over the years. Still, first and foremost, Fight Stories was a boxing magazine. Practically every cover features a boxer in the ring, wearing gloves and usually in the process of throwing a punch. The few exceptions are occasional close-ups of rugged male faces. Inside the magazine, a majority of the stories are about professional boxers, and include a variety of "As told to" stories fictionally narrated by some of the era's most popular fighters, such as Jack Dempsey and Tony "Two Ton" Galento. These combined with nonfiction essays, such as "The Ten Best Fights of All Time" and "Famous Fights I Have Seen," give Fight Stories its subtitle "Fiction and Fact of the Ring." 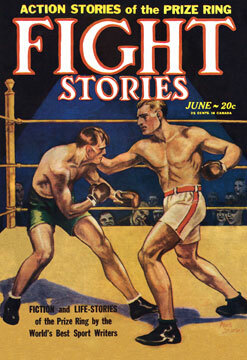 Fight Stories helped establish a model that would be used by sports pulps throughout the era. As Frank Robinson and Lawrence Davidson have noted, sports pulps tend to have "a split personality…recognizing that their readers' interests [are] in the reality of sports as well as the fantasy" (126). In Fight Stories, the line between the "Fiction and Fact of the Ring" was—from the start—purposely blurred, as Kofoed had acknowledged it would be: "Here you will find a rallying place for men of your kidney. Here the best sport writers of your day will spin their yarns of romance and action and adventure of the prize ring." Dinah, John. Sports in the Pulp Magazines. Jefferson, NC: McFarland, 1998. Finn, Mark. "Fists of Robert E. Howard." The Barbaric Triumph: A Critical Anthology On The Writings Of Robert E. Howard. Ed. Don Herron. Rockville, MD: Wildside Press, 2004. 11-35. Nolan, Michelle. Ball Tales: A Study of Baseball, Basketball and Football Fiction of the 1930s through 1960s. Jefferson, NC: McFarland, 2010. Robinson, Frank M. and Lawrence Davidson. Pulp Culture: The Art of the Pulp Magazines. Portland: Collectors Press, 1998.